Convert DVD Movies to iTunes and convert video to iTunes on Mac OS X. DVD to iPod Suite for Mac is a very powerful DVD Movies to iTunes converter and video to iTunes converter for Mac OS users. DVD to iPod Suite for Mac is a suite Mac iPod suite conversion program with DVD to iPod Converter for Mac and iPod Movie Converter for Mac combined. It is a discount software to convert DVD Movies to iTunes and convert video to iPod on Macs. A professional application developed for Mac OS X users. Rip DVD Movies to iTunes and convert video to iTunes supported video and audio formats on Apple Mac OS X. Crop video to remove black sides from your DVD or video files. 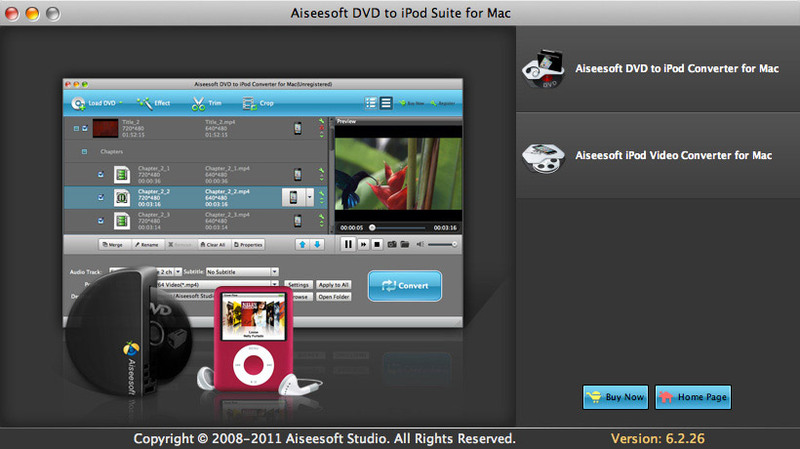 DVD to iPod Suite for Mac lets you enjoy your DVD movies and video files on your iPod with just a few intuitive steps. Why Choose DVD to iPod Suite for Mac?